Samsung Galaxy Star Pro duos GT-S7262 is now available from online retailer in India. The Gt7262 device comes with entry level specifications and features, even it lacks 3G features. The Samsung GT S7262 Galaxy Star Pro Duos comes with 4 inch capacitive touch screen display, powered by a 1GHz single core Cortex A5 processor and runs on Android v4.1 Jelly bean operating system. The handset would compete with recently launched Samsung Galaxy Trend Duos, Trend 3, Karbonn A8, Celkon AR45, Spice Mi 436 and Gionee Pioneer P2. All the above phones comes under the price of RS 7500. The Samsung GT-S7262 has 4 inch WVGA (480×800 pixels) capacitive touch screen display and gains the power from 1GHZ cortex A5 processor paired with 512MB of RAM. It is a Dual SIM smartphone. The Galaxy Star Pro gts7262 packs with 2MP rear facing camera and has 4GB of internal memory, further it can be expandable up to 32GB via microSD card. The Star Pro Duos features 2G, WiFi, Bluetooth 3.0, EDGE, 3.5mm audio jack and micro USB port 2.0 connectivity. The handset has 1500 mAh battery which claims to offer the talk time of up to 15 hours and standby time of up to 370 hours. Talking about the built it is 10.6mm thick and weighs 121 grams. It comes in white color. You can buy the handset from Amazon.in. If you are from the USA grab it from AMAZON.COM. The handset will be soon available in the stores across the India. 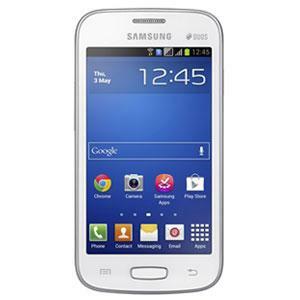 The Price Samsung Galaxy Star Pro GT7262 is RS. 6,989.
nice phone. As i have lab top , feel no 3G interference, camera fine resolution. Size comfotable. very satisfied. its worst phone ever...... I am using this phone.....and I want a 3G phone. How to connect 3g service. Nice phone but lacking in front cam and network. This 22nd century alas! It is the worst & useless mobile as it is not supporting 3g,without 3g it is like hell. Sometimes I feel to destroy it.It is the worst & useless mobile as it is not supporting 3g,without 3g it is like hell. How can i use an otg cable in this 7262 phone?....please help....urgently! No, it doesn't support that. I am using samsung galaxy star pro gts7262 but 3g net not working please help me. @Wajih Ahmad , it lacks 3G connectivity. So it won't be able to connect to 3G network. This phone is good..i hv noticd it often work lyk 3g..jst neded front cawera nd flash...bt I thnk da price is too mcg.!! Jo b h best h.